Editor’s note: This post originally appeared on Jesse Erdmann’s blog Screaming at Pigeons. Jesse is a long time friend and technical consultant to IMSoccer and du Nord futbol. He is also a board member for the Dark Clouds, supporters of pro soccer in Minnesota. After reading this post it will become clear that Jesse loves soccer and loves numbers and particularly enjoys it when he can mix the two. 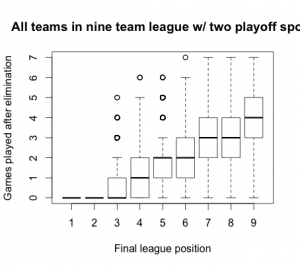 In this edition, the focus is on how long teams are eligible through each half of the season and the number of games without bearing on the playoffs we can expect in coming seasons under the 2013 format. 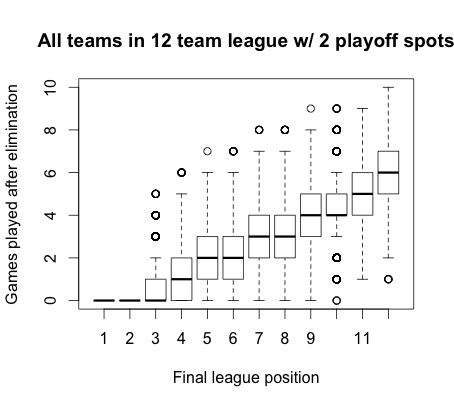 We’ll also take a look at how adding teams to the postseason can extend the eligibility of poorer performing teams and the reduce the number of games with no bearing on the post season. The simulations were run with several different league configurations, from an eight team league representing this year (and possibly the 2013 apertura if you subscribe to the rumors about the Cosmos not being ready) up to fourteen teams. Why so many? 2013 is expected to have nine teams competing, but when the data was initially being generated ten seemed possible. 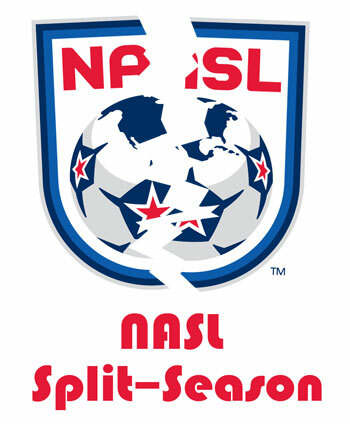 For 2014, 11 teams are announced including Ottawa and Loudoun County with Indianapolis seeming to be a strong contender for number 12. There is always the possibility of another team or two being announced between now and then so the simulations were run with up to 14. In a double round robin this means that each team in an eight-team league will play 14 games, while in a 14-team league each team will play a 26-game schedule. When simulating Edmonton at San Antonio, Edmonton’s road loss expectation is averaged with San Antonio’s home win expectation for the odds of a San Antonio win and vice versa for an Edmonton win. Edmonton’s road draw and San Antonio’s home draw expectations are also averaged for the odds of a draw. In this example, the odds of San Antonio winning would be 57%, a draw 25% and an Edmonton win 18%. A random number from 1-100 is generated to determine the outcome with 1-57 representing the San Antonio win, 58-82 a draw and 83-100 an Edmonton win. Each season, in addition to randomized team profiles, generates a randomized double round robin schedule. One of the aspects of the simulation that varies from reality is that each round has all teams playing one game per round at the same time. So in an eight-team season it is like every Saturday all eight teams play at the exact same time for the entire season. Seasons with an odd number of teams are slightly different in that each round one team has a bye week, but the schedule doesn’t balance this out so one team might start the season with two bye weeks in some cases. The order the rounds are played in is randomized each season so that it is more likely that some seasons will have good teams starting the season on a home stand against bad teams, others will have good teams start on the road against other good teams and everything in between. Over many seasons this will present a good idea of what the average season will look like as well as what the best and the worst case scenarios look like. 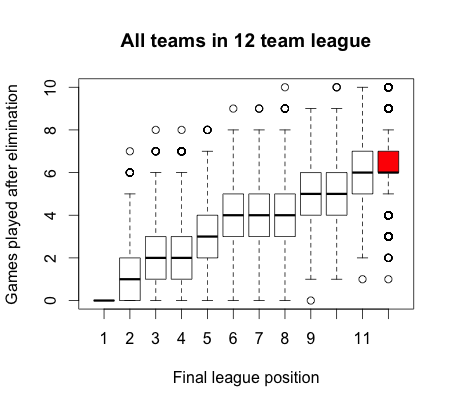 For each number of teams, from eight to 14, 10,000 seasons were simulated. This reduced the variability from simulation to season to almost zero and still completes in about ten seconds with the software as written. Originally, 1,000 was the planned target, but rerunning the same configuration produced noticeably different results and reproducibility seemed a good goal. In the figure, you can see that for the eight team league, teams begin to be eliminated in round 9 of 14 with round 10 being the most common round for the worst team to be eliminated. On average of the 10,000 seasons, the final round saw 1.9 teams still eligible. In the worst case scenario, the championship is locked up with five rounds remaining, but the most common result is that the top two teams entered the final round vying for the half season championship. Looking at the opposite end of the spectrum, teams start being eliminated as early as round 15 of 26 with round 18 being the most common round for the first elimination. 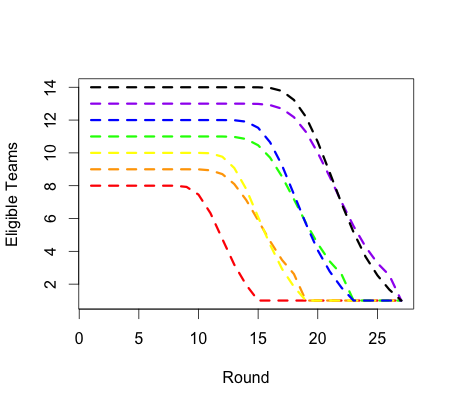 In the final round, the average number of teams eligible was 1.6. The most common outcome was that the championship was locked up in round 25, leaving one round to be played with the title already being decided. One thing that the graph reveals is that in a league with an odd number of teams, the byes extend the length of time teams remain eligible for the post season and increases the number of teams eligible for the post-season in the final week of the season overall. With that in mind, let’s look at the expected nine team outcomes for 2013. 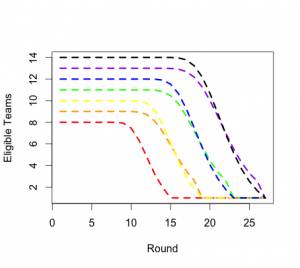 Round 10 of 16 is the earliest elimination with round 11 being the most common. On average, 2.6 teams are still in contention during the final round thanks to bye weeks. The most common outcome was that the top two teams still had it all to play for in the final week. For a closer look at next season, let’s examine the 10,000 simulated outcomes for the last place team in a nine team league. The histogram to the right shows how many of the 10,000 outcomes had each possible outcome. In 2,760 of the seasons the eventual last place finisher eliminated with three games remaining in the half season. Another 3,005 saw the last place team eliminated with four to go. That means if you are an unlucky fan of team nine in the apertura, 25-30% of your season, a.k.a, June or October, will be played after your team is eliminated. In the absolute worst case, 43 seasons saw the last place team eliminated with seven games to play. On the flip side, the last place team was still mathematically involved on the last day of the season 31 times. 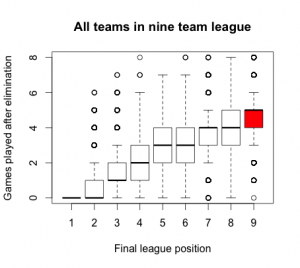 information above to a single column in a graph allowing us to see all teams in the nine team format in a single image. 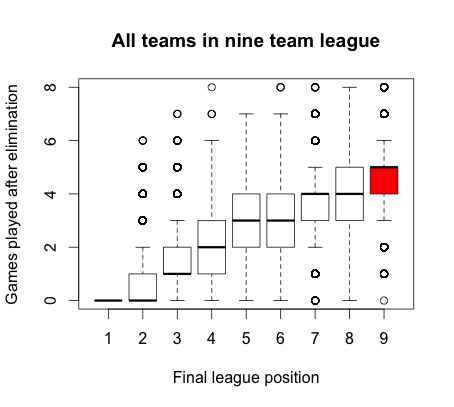 The ninth place team in the graph to the left is still colored red and shows exactly the same information as the above histogram. Obviously the first place finisher in all 10,000 seasons never suffered having to play a game after being eliminated, but every other team did. Over all seasons, fourth place or lower was eliminated with eight games remaining, fully half of the season, at least one time (exactly once for the fourth place finisher) and even the second place finisher was eliminated as early as with six games remaining. 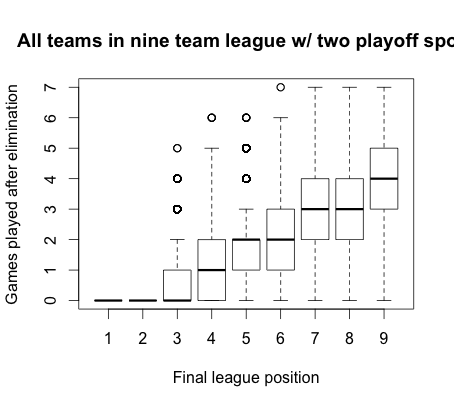 With regards to games where both teams have been eliminated, adding a second playoff spot drops the per season average from 13 to 7. All games with featuring at least one team that has been eliminated would drop from 43 to 31. 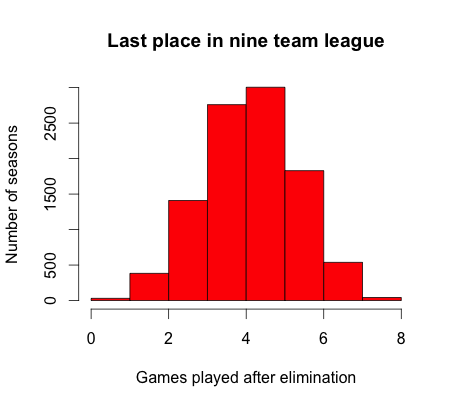 As it turns out, ratio of teams to games remaining after elimination is fairly linear. No matter what, there will be more games played after a team is eliminated from a shot at the championship in 2013 over 2012. The more teams that are added, the more those games increase as well as one would expect. In the end, the crux of the matter will come down to how much that chance at the championship drives attendance versus perceived performance. Had the new format been in place in 2012, we might have had a good sample as to whether playoff contention affects attendance in Atlanta. The Silverbacks would have been eliminated fairly early, but with the Wynalda revolution they started winning games. Would attendance have stayed at the same level after the team was eliminated even if the team started playing well? We might have a chance to put this question to the test in 2013.